After the one-two punch of Rise of the Machines and Salvation it's unclear who exactly was clamoring for more Terminator films, but Arnold Schwarzenegger's career clearly called for a boost and so here we are. It is easy to be cynical, but it's difficult to let go and embrace an entity for what it might be regardless of the strings attached and the fifth film in the Terminator franchise certainly had some heavy strings attached to it. From the moment the title was revealed with its misspelled subheading there has been something of a backlash towards the film, an inherent feeling that whatever this could be it would really only be little more than a cash grab and excuse to reinvigorate its stars dwindling career. The trailers, posters and overall spoiler-heavy promotional campaign did little to booster any kind of confidence in the final product and only added to the complete lack of interest on my part as the expectations really couldn't have been much lower. 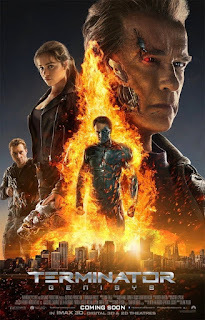 Given that environment I came away from Terminator Genisys rather surprised at how much I enjoyed myself. This brings us to the question of if a movie can be entertaining without necessarily being what we might typically consider "good"? As far as director Alan "Thor: The Dark World" Taylor is concerned it seems he thinks so as he has again crafted a cookie-cutter studio film that follows the template of any other action film and, if nothing else, creates an entertaining film that I was able to consistently have fun with as it continued to defy my expectations of not actually being horrible. The real tragedy of the project is that there might have actually been more to tap into here. With the two listed screenwriters being Laeta Kalogridis (Shutter Island, Alexander) and Patrick Lussier (Drive Angry) the expectations are again leveraged due to the somewhat bad quality of many of their credentials, but it's clear a lot of thought and planning was put into re-tooling the storylines of the first two films so that Arnold's T-800 might have a more substantial role and so Paramount might launch another trilogy of films. The problem is, the film never utilizes the social commentary or ideas around mortality that it touches on sporadically to be anything more interesting than a two-hour sizzle reel of action scenes. John Connor (Jason Clarke) stands tall as the leader of the human resistance. To try and explain the plot of Genisys is an exercise in accessing a higher brain function that I'm not willing to rise to for this review and so it is easiest to explain the film as opening with a heavily narrated bit of reminders that actually outline the future we've constantly heard discussed in prior films come to a sort of fruition. 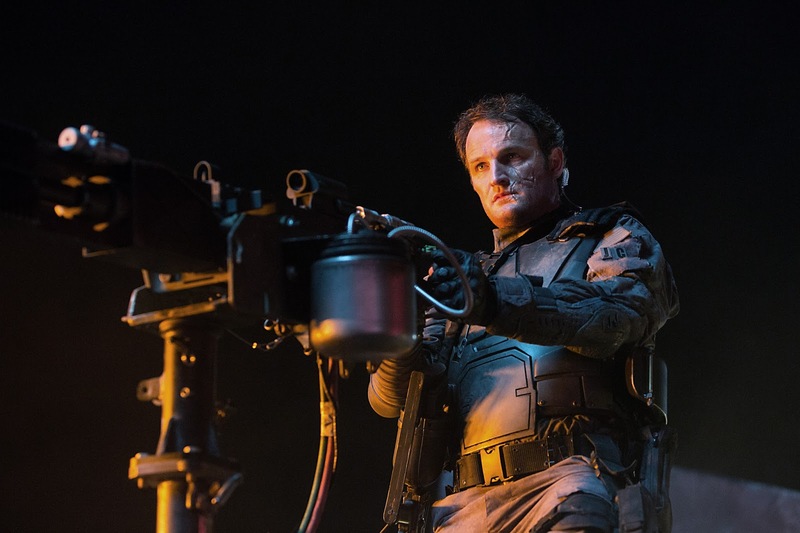 There is a more widely illustrated canvas with which Taylor presents the war against the machines and SkyNet that John Connor (Jason Clarke), leader of the human resistance, and Sgt. Kyle Reese (Jai Courtney) wage as they infiltrate the SkyNet headquarters to shut down the machines once and for all and destroy the time machine they use to send Schwarzenegger's Terminator back to 1984. As this critical event has already occurred by the time they make it inside John Connor is forced to once again send Reese back to protect his mother, Sarah Connor (Emilia Clarke), and safeguard the future. When Reese arrives in 1984 though things are not as they were in the original Terminator as Sarah Connor is more in line with the Sarah Connor we know from Judgement Day than the meek waitress we met in the 1984 original. Reese immediately comes face to face with a liquid metal T-1000 Terminator (this time portrayed by Byung-hun Lee) who has been sent back previously to ensure Reese doesn't meet Sarah and become the father of John Connor, but given someone also sent back a T-800 to Sarah when she was a young girl she has been training and preparing for this moment almost her entire life. And so, Connor and her T-800 model which she affectionately refers to as "Pops" swoop in to save Reese and open up an entire new world of fractured timelines. These new developments add a layer of extreme confusion to the proceedings as now, with this change in events, the future has been reset from judgement day occurring in 1997 to twenty years later in 2017 where Sarah and Reese must travel next in order to again try to reset the future while coming face to face with a familiar, but unexpected obstacle. This overly complicated storyline is clearly present for the sole reason of implementing Schwarzenegger's character into the fold in a more critical way so that both he and the studios financing these films have reason to invest their time and money in them in the future. Granted, if you are a huge fan of the first two films (and even the third, which I don't actually remember being all that awful, but more a retread of the second film with a lady terminator instead of Robert Patrick) there might be some anger to be conjured up at this fifth installment as it essentially wipes them off the map and starts fresh so as to be able to have a new trilogy. That said, this new timeline is ripe with possibilities for what could happen, though the lingering question of who sent Pops back in the first place is an unanswered aspect I only hope Kalogridis and Lussier already know the answer to as the mid-credit tease we get doesn't really imply the best of paths they might take, but rather hints at the obvious road we'll travel if this one does indeed make enough money. Enough about the future though, let us speak to the film at hand as it is a film I will undoubtedly be made to feel bad for liking and so I must defend what I found appealing about it. The first thing that springs to mind a day after my screening is the certain energy and momentum the film has to it. From the opening moments the film dives in both to its action sequences and its story it has to continually talks about in order to make sure the audience is up to date in order for it to both make sense and continue moving forward. It is no doubt a challenge to keep up with all the logistics of the time traveling and I'm not sure one could keep up had they not seen any of the previous films, but Taylor employs a kinetic style that, along with the editing, keeps things brisk. Admittedly, what Taylor doesn't care to do is add any depth to the proceedings, but instead keeps things moving so fast that we don't get caught up in any of the bigger questions and instead move on to the next action sequence so quickly that the action scenes much less the film itself don't differentiate themselves from anything we haven't seen before. 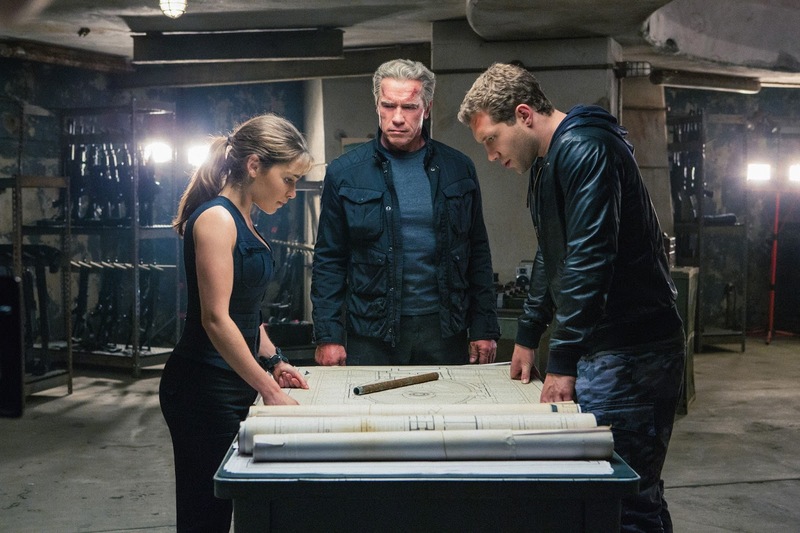 Sarah Connor (Emilia Clarke), Pops (Arnold Schwarzenegger) and Kyle Reese (Jai Courtney) in Terminator Genisys. The other nagging aspect of Terminator Genisys is that of the casting. Mainly, that of the generic Jai Courtney in what is essentially the lead role. As much as Genisys is engineered to make Schwarzenegger a box office star again, this is a movie about the plight of Kyle Reese. Emilia Clarke, who I've not seen in Game of Thrones and looks strikingly like a younger Helena Bonham Carter, is equally as wooden in the role of Sarah Connor as Courtney is as Reese. The two have something of a chemistry I guess and they aren't actively bad, they're just fine and nothing more. Neither of them bring anything vital or innovative to the roles and to a degree Clarke is at something of a disadvantage given prior interpretations, but Courtney has room to create a side of this protagonist we haven't seen before and just...doesn't. Schwarzenegger is supposed to be the stilted cyborg, but his performance is infused with more charisma than the two leads combined. It is the other Clarke, Jason, that luckily adds some bite to his role as he, while clearly having the most scenery to chew, takes advantage of his character's circumstances and delivers an interpretation of a villain that is worthy of rooting against even if the heroes feel slightly uninspired. It should be noted that J.K. Simmons shows up in a small supporting role that seems might be more important if we do in fact see a few sequels while the appearance of Matt Smith (Doctor Who) is purely for the sake of future installments. I hate to say that Terminator Genisys is putting the cart before the horse as it really does have some redeeming qualities that make this a fine summer/action blockbuster that above all, does consistently entertain, but like many films in our cinematic landscape today it is too focused on what comes next rather than the here and now. The one thing Genisys does do well that I assumed it would fail miserably at was that it doesn't feel tired. Whether it be the low expectations or the relentless forward momentum the film takes a note from Arnold's mantra and acknowledges that it may be an older property, but isn't out of juice just yet rendering it not as obsolete as everyone would like to think.